Starcraft is military science fiction that focuses on three warring species: the power-armor-clad Terrans, the monstrous bio-engineered Zerg, and the technologically advanced Protoss. Starcraft's first (and most obvious) narrative antecedent is Starship Troopers. It's almost impossible to write military science fiction that escapes the shadow of Heinlein's classic novel, and the debt here is mostly to the novel's aesthetics. The Terrans of Starcraft may wear power armor, but their culture and history is a far cry from the Terran Federation of Heinlein's novel. These Terrans are hard-drinking, hard-fighting descendants of criminals and other undesirables that Earth shot off into space. Besides some typical shady government stuff (like experimenting on their own citizens to develop their latent psionic abilities) the Terrans also set up a society that is more Appalachia and less Heinlein's military utopia. They even go so far as to name their government the Terran Confederacy and revive the Confederacy's flag. The Terrans are not entirely sympathetic as a society and spend just as much of their time fighting each other as they spend fighting the Zerg or the Protoss. Most of their storyline in the first game concerns Jim Raynor (left), one of the few truly stand up guys you'll meet among the Terrans. Raynor overthrows the corrupt Terran Confederacy for the mysterious Arcturus Mengsk. The species of Starcraft may resemble familiar sci-fi creatures, but this resemblance is only skin deep. The Zerg visually descend from the buggies of Starship Troopers by way of H.R. Giger influence. However, their culture and story once again set them apart. Instead of a typical hive-mind, the Zerg seem more to network together into many groups. This allows for political maneuvering and betrayal at the top levels of Zerg society in spite of their hive-mind culture. In fact, the Zerg cerebrates that control the species often plot against each other during the course of Starcraft. The Zerg also have an obsession with absorbing the unique genetic abilities of any new species they come across. Their current leader is a powerful human psionic named Sarah Kerrigan who was converted into a Zerg during the events of the first game, and there's been some indication that they're working to create hybrids of the Protoss and the Zerg. The Protoss are the warrior/poet race of the Starcraft universe — they mix the looks of the Eldar from the science fiction miniature game Warhammer 40K with the history of the Vulcans from Star Trek. The Protoss are now highly devoted to their religious code, but they were once an incredibly warlike race. In their ancient past, the Protoss were created and watched over by the Xel'Naga, who turned their back on the Protoss when they descended into warfare — the Protoss wanted to show who was most worthy of attention from their creators. After the Xel'Naga ditched them, the Protoss eventually got it together with the help of an ancient religious leader named Khas who united all of the warring Protoss with a psionic link. This link allowed them to empathize with each other as a single peaceful species. The Protoss now try and make amends for the actions which drove away the Xel'Naga, whom they kind of consider to be the Protoss version of Original Sin. During the events of the first Starcraft game, the Protoss are forced off their homeworld by the Zerg, find a new religious leader, and reunite with their prodigal heretic clan that severed the psionic link to preserve their individuality. Despite the unique aspects of the Starcraft universe, the game's creators are good sports about the similarities to other scifi works and often name characters after their scifi forebearers or give them dialogue straight out of sci-fi history. For instance, the Terran dropships quote Aliens obsessively (i.e., "In the pipe, five by five!" and "Hang on, we're in for some chop!"). But what makes Starcraft an exciting part of the military science fiction canon is the way it lets you play around — both literally and metaphorically — with the story universe. The storytelling of a novel tends to be deep but not broad. By the time you get to the end of Starship Troopers, you know almost everything there is to know about the military culture of Heinlein's future Earth. However, the Buggies are still largely a mystery and the Skinnies are utterly unknown outside of their brief appearance at the start of the novel. Starcraft's story shifts between the viewpoints of all three species, giving you a full look at the way each of them operates. Characters from one species often appear later as opponents or temporary allies. For example, the player meets Sarah Kerrigan for the first time as a Terran, but she's later converted into a Zerg as you play through her story, giving both you and her a chance to adapt to her Zerg persona. The result is a universe that feels almost too full to explore with a traditional story. Many of the most interesting elements of the Starcraft universe, such as the Xel'Naga and the discovery and development of human psionic abilities, are only briefly mentioned in the game proper, leaving the player to explore those ideas outside of the core narrative. Unsurprisingly, Starcraft has spawned quite a few spin-off stories. There's a novel that explores Kerrigan's rise to power among the Zerg. 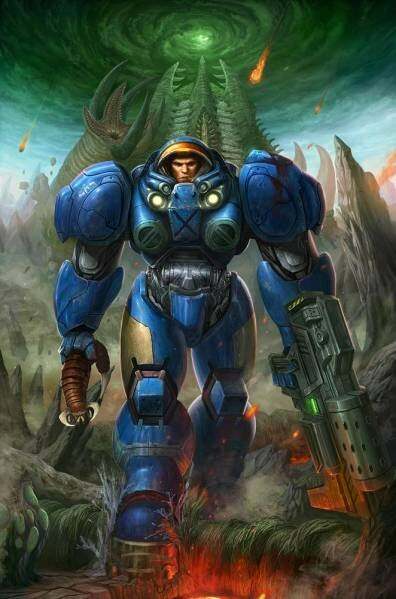 More recently, Blizzard has released a series of manga stories set in the Starcraft universe that cover topics only briefly touched upon in the first game, such as Terran research into the Zerg and the Protoss. Currently, the Starcraft universe is pretty screwed up. The Protoss are in bad shape and trying to set up a new homeworld. The Terrans aren't doing much better after Earth rediscovered them and — just barely — failed to conquer them. Meanwhile, Kerrigan, the new undisputed leader of the Zerg, is poised to take over the galaxy. So what new directions is the story taking in its sequel? Since it hasn't been released yet (and most of the previews have been of the story-free multiplayer version), we don't know the whole of the storyline, but we do know a few things. Starcraft II's initial release is going to concentrate once again on the Terrans. The revolution from the first game has come back to bite Jim Raynor. After helping overthrow one government, Jim Raynor's former ally Arcturus Mengsk has set himself up as the totalitarian leader of a new Terran Dominion and branded Raynor as a terrorist and traitor to the state. As a result, Raynor has fled to the edges of Terran space and become a mercenary accepting missions from anybody of any species as long as he deems the goals acceptable. The big news concerns the return of the enigmatic Xel'Naga, the ancient alien race that helped spur the development of both the Protoss and the Zerg. Initially, this may sound like good news considering the nasty state of affairs at the end of the first game. However, from what we know, the Xel'Naga aren't very fond of any of the game's many species. The Protoss are a failure in their eyes, the Zerg are a plague upon the galaxy that actually attacked them and drove them away, and who knows what they think of these weird pink-skinned Terrans that have shown up since they left. It seems likely that their plan to fix the situation will be some variation on killing them all and letting God sort them out. This plan's unlikely to go over too well with any of the game's major characters.